Ed. 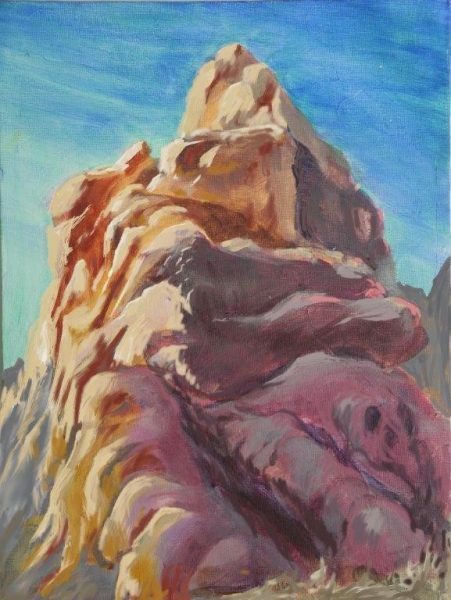 note: In the grand tradition of early desert painters, Jim Trolinger sees plein air painting as a team sport. We previously posted Jim’s tale of his group’s Death Valley expedition. 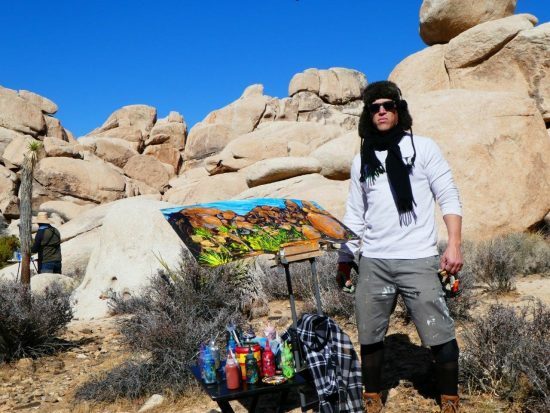 In his latest account, the optical physicist and his merry band of painters take on Joshua Tree. 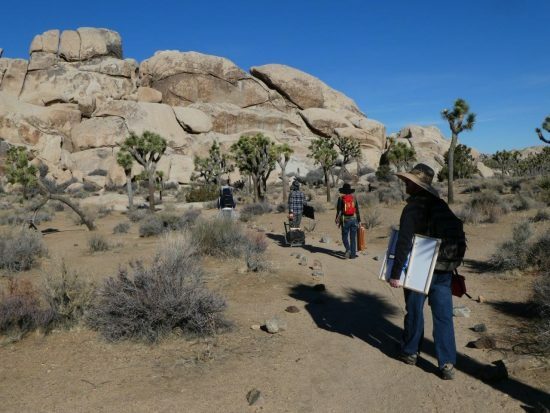 In February 2018, the Magnificent Six+ returned to Joshua Tree National Park for yet another desert paint out. Jim Trolinger, Pauline Abbott, Zeke Guspan, Geoffrey Winnie, Steven Seizo Nakamura, and Jesse Fortune are the original Magnificent Six and the plus comprises artist friends who join in various outings; this paint out included also Marissa Head, Ruth Geller, and Robin Theron. 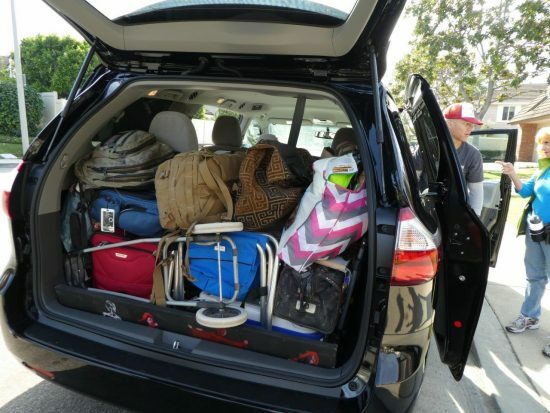 Van loaded with art gear and luggage of five artists. Zeke drove separately. Part of the mission of the outing was to test the capacity of a smaller Toyota van, which would be much more comfortable than larger, more rugged Ford vans taken on previous outings. We were searching for a van choice for a much longer, more distant painting venue, which would take us as far as Moab, Utah later in the year. Could the Toyota support six artists and equipment for a 10 day excursion or should we rent a larger, less comfortable, twelve passenger van similar to those used before? During our first day we quickly determined the answer to be no. So much for comfort. Even so, we discovered that United Van rentals now stocks a more comfortable 12 passenger van, which would serve us well for the longer trip. 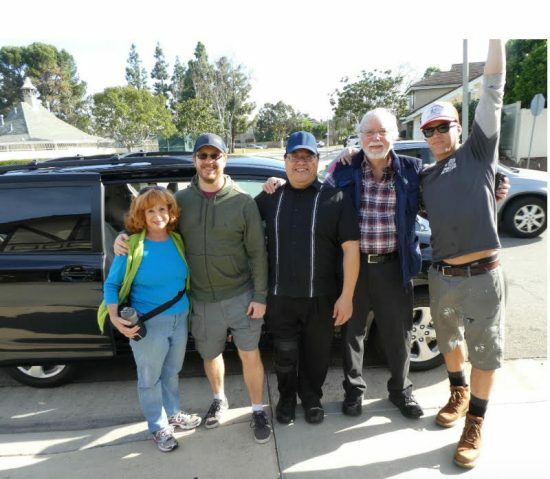 Ruth Geller, Geoffrey Winnie, Steven Seizo Nakamura, Jim Trolinger and Jesse Fortune ready to roll. 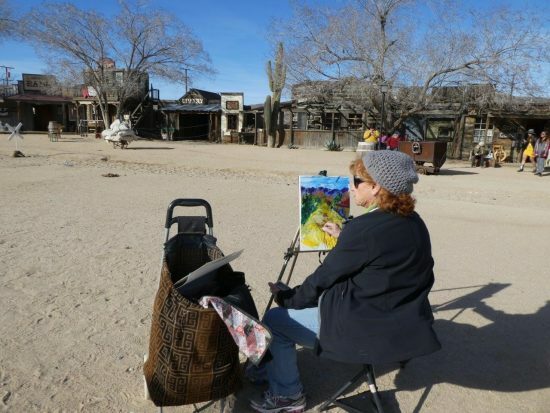 We made our first planned painting stop at Pioneertown, a small diversion, just north of the town of Joshua Tree. Pioneertown offered a pleasant surprise, bustling with tourists and a street of 19th century structures, widely used by the movie industry for westerns. During our stay we witnessed music, dancing, and gunfights in the street. One thing became obvious, however. With temperatures hovering in the forties and strong winds making it seem much colder, this was going to require more clothing than we had originally thought. We set up easels along Mane Street (actually, the only street) and produced our first pieces of the trip, with a few of us producing two or three representations. 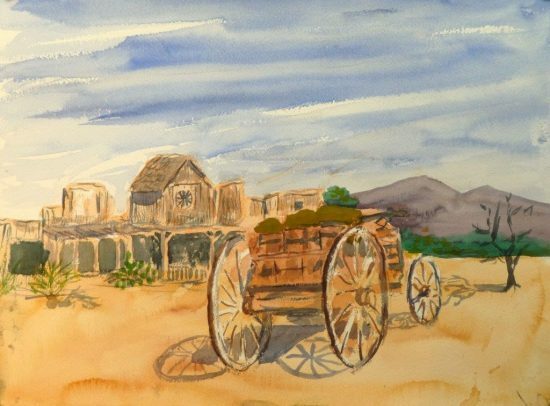 My scene of choice was a wagon, loaded with hay with an interesting background of old buildings, and I spent most of the stay working on this water color. Western music and dancing provided an interesting accompaniment and I took breaks to witness and sketch a few gun fights over the next three hours. 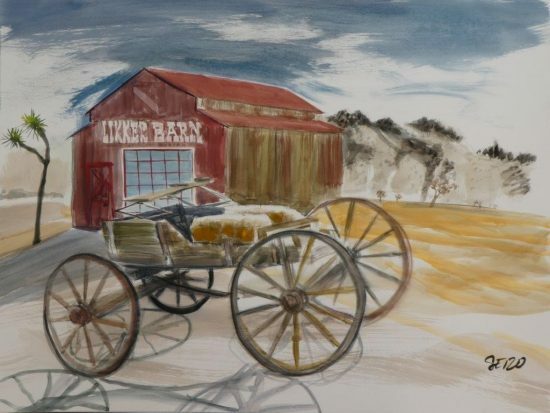 Steve painted the same wagon from the opposite side, which provided a background including the “Likker Barn”. He also produced a water color of two locals. One thing became evident by now, even though it was a bright sunshiny day, the winds made the 50 degree temperature seem a lot more nippy. We all began to wonder if we had brought enough layers. After few hours of painting Pioneertown, we headed for nearby Twentynine Palms and arrived around 4 PM, had a meal in a local Mexican restaurant, and checked into the 29 Palms Inn, where we had reserved The Penthouse, The Buffalo Burr, and Cabin Z. We assembled at the Penthouse, which was shared by Zeke, Jesse, Geoff and Steve, to make plans for Sunday. As we discussed Sunday, a few guys continued finishing paintings from Pioneertown, some of us tested varieties of Scotch and whiskey and I assembled a 65-piece jig saw puzzle of the Magnificent Six in Monument Valley. Robin Theron and Marissa arrived as we finished breakfast and we all left for the park at 9. We distributed the seniors who possessed Golden Passports between three vehicles, so everyone could get in free. The Golden Passport, a lifetime pass granting free entry to all national parks for a carload, originally costing $15, gets more and more valuable as the entry fees continue climbing. In the park we scouted a few potential painting spots and everyone liked the prospects at “Hall of Horrors” where we painted the remainder of the day. I attempted to get out of the direct sun. That was a mistake. What I should have considered first was to get out of the wind. Not only was I freezing most of the time, it seemed as if the wind was playing with me. Each time I would get used to a steady breeze and start to really get into painting, a big gust would rip the painting from my grip and fling it across the rocks. People on my end of the park had to tolerate my occasional use of unsophisticated language. Back at the parking lot at noon we lunched from lunch bags supplied by the hotel. These included a large sandwich, chips, fruit, and a huge cookie. 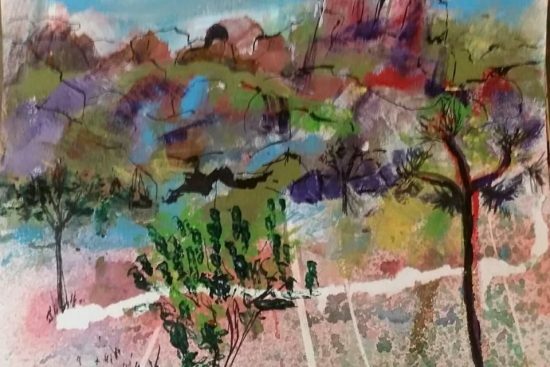 In the afternoon, after conferring with other artists, Robin demonstrated finding a sweet spot out of the wind by sitting close to a large rock or bush on the leeward side. 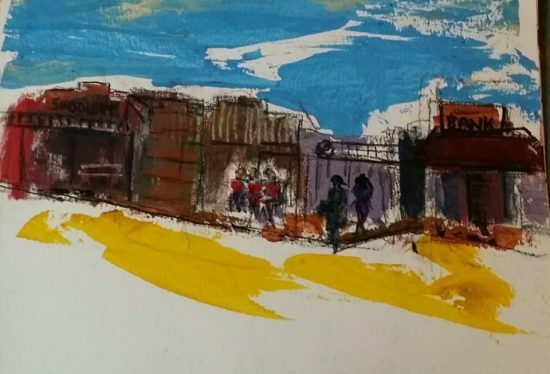 Using Robin’s trick, I found a spot in the sunshine, sheltered by a large bolder out of the wind, found it oh so much more comfortable painting and moved into the zone for hours, interrupted only by an occasional tourist who wanted me to know about his grandson who paints. After another four hours, we packed our gear, returned to the hotel, and prepared for our traditional critique. My Buffalo Burr cabin has a nice patio area. We placed paintings from both days along the wall and went one by one, discussing the various choices, problems, and potential fixes for the paintings. As always, everyone contributed something to the snacks, and Steve blessed us with a unique culinary experience of bison salami. Dark crept up on us fast and we eventually moved into the inside light to finish working Jesse over. By this time, it was also getting rather cool and the roaring fire I had going in the fireplace was welcome. After the critique, I was so full of snacks, I skipped dinner but joined the others as they ordered drinks and various items from the menu to share, and I did manage to sample a slice of pizza. Before adjourning, we ordered our lunch snacks to be picked up in the morning. 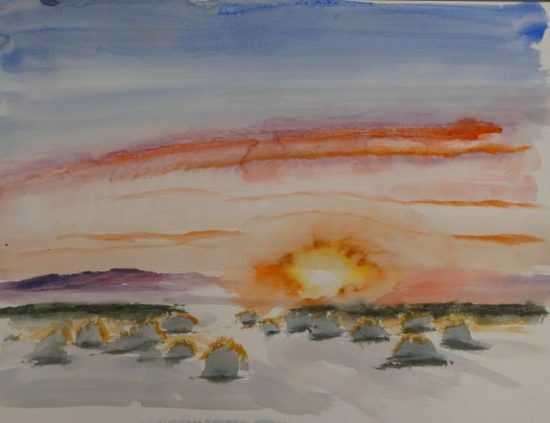 I had told everyone about the beautiful sunrise seen that morning from Buffalo Burr, and without any hesitation, Steve responded, “Who wants to paint it with me in the morning?” This guy could paint 24/7! Only Steve and an amazing sunrise can get a Trolinger out of bed before sunrise. We had 30 minutes of amazing, changing, paintable light before we would be staring straight at the sun. Here’s what we created. Steve continued, staring into the sun long enough to capture it in watercolor. lovely! art expedition by the intrepid spaghetti western painters, dear ann, makes life look easy! They are having WAY TOO MUCH FUN! -making beautiful art of our precious desert at the same time. I’m jealous. Enjoy so much reading of their desert adventures. Thank you. Very interesting and a joy to read. The paintings are beautiful. Thank you dear Ann for sharing and expanding our knowledge of desert art. I liked Marissa’s Hidden Valley painting. Very nice!